Enter the afterlife and defeat Septima Tharn. 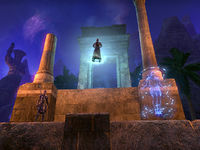 Imperial Magus-General Septima Tharn captured King Emeric and took him into the Chamber of Passage. It's apparently a gateway to the plane known as the Far Shores, where Redguards go in the afterlife. Talk to the Keeper of the Hall. Enter the Chamber of Passage. Directly after completing Trials and Tribulations, you can start the next quest by continuing to speak with the Keeper of the Hall. He is somewhat perplexed about Septima Tharn's reasoning for apparently using the Chamber as a prison. He will then explain just what this place leads to. "The real mystery is what's a woman like that wanting to do in a place like this? She has a prisoner, but the Chamber of Passage is not a place for holding someone, it's a place for sending someone on!" Sending someone on to where? "To the Far Shores, of course. This is it. This is the path the souls of heroes take to move on to the … afterlife, as some call it. Souls used to be flying through here all the time. Guess there just aren't as many heroes any more …." Is Septima Tharn trying to get to the Far Shores? "You think it's just an elaborate suicide plot? Afraid I don't share your optimism. But what is she doing in there? I'd say "only the gods know", but I don't think they do. The way I look at it, there's only one way to find out." I understand. I'm going in. Once you enter the Chamber, you will emerge in an outside area, flanked by cliff and ruined columns. At the opposite end from entrance is a shallow pool. As go further in you will see a restrained High King Emeric next to Septima Tharn. Once she notices you she will mock Emeric by saying, "Ah! Look Emeric, your saviour has arrived! Or is that our executioner?" Septima Tharn will then stab him and disappear. You can then rush over to Emeric to see how he is. As he speaks his final words, "I suppose I must say goodbye, my friend. I'll see you on the other side …." and dies, his soul will emerge from his body in mass of blue light and head in the direction the giant portal which has emerged from the pool. 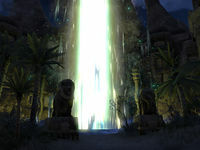 With no other choice, you will need to enter the portal to the Far Shores and bring back Emeric's soul. 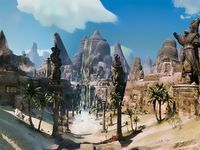 After you enter the Far Shores you will be greeted by a vibrant world full of sand, palm trees and giant statues. When you travel down the path it will open up to an open space which has a large, stone-tiled ring in the center. As you get closer you will notice Emeric's soul on top of the ruins, he is still bound by the chains that formed around him when Septima first took him. He will soon notice you and call out. High King Emeric: "You're here too? Can you get us back? It's quite pleasant here, but I'm not ready to die yet! We can't let them win!" Septima Tharn then will appear and reveal her true target—you. She believes that this place cuts you off from your soul trapped in Coldharbour and so by killing you here, your death would be permanent. Septima Tharn: "Hush now, Emeric. Your death matters little—there are other kings. It's this one I wanted. The one who's been holding the Covenant together at every turn. The vestige from Coldharbour." Septima Tharn: "Didn't think I knew, did you? I did, and I knew I couldn't kill you … on Mundus. Here though, you're severed from Coldharbour, from your soul. Here, you're stuck. Goodbye now." At the moment she is about to attack you, the Keeper of the Hall will appear floating in midair while surrounded by glowing wisps of magic. He is infuriated by Septima's arrogance. The Keeper will then turn to you and make a deal. At these words Septima will appear in the center of the fighting ring in a plume of fire, ready to fight you. During her fight, Septima uses many of the skills battlemages used, though they are more powerful. She also dabbles in necromancy and when she hits certain amounts of health, she will retreat and summon squads of Hel Shira Spirits to fight you. Each time this will be announced by Septima's taunting. Septima Tharn: "Here or there, the dead are mine to command! Hel Shira! Rise and fight!" Septima Tharn: "If it were my aspiration, I could rule this plane!" Once Septima Tharn is dead, Emeric's soul will be freed but he cannot return to the Mundus on his own. Speaking with him will allow you to hold it. When you finish speaking with him, you will now be holding High King Emeric's Soul. The Keeper will then appear and can be spoken with. He will keep up his end of the bargain and send you and King Emeric's soul back to Tamriel. "Were it truly your time, I might invite you to remain here in the Far Shores. You have earned the right to be here. It is not your time though, so you must go. Take your liege back, restore him, and then you must all leave the Hall of Heroes." I understand. Return us to the Hall of Heroes. Once you finish speaking with the Keeper you will be teleported back to the Hall of Heroes. When you get back, you will find that Queen Arzhela and the Lion Guard are in mourning. Queen Arzhela: "My cousin … my king … I'm sorry we failed you." To restore High King Emeric's soul, you will need to interact with his body. A blue light will leave you and enter the corpse. You can then speak with him about the experience, though he is certain there are more things on the horizon. You will then receive Shore's Edge, gold and a skill point. †Messages Across Tamriel is only given to Covenant players. For Pact or Dominion players, this quest marks the end of Cadwell's Almanac for the Daggerfall Covenant. Assuming no required quests ( ) have been skipped, the related quest should now instruct you to return to The Harborage. I must search within the Chamber of Passage for signs of where Septima's taken the king. I must try to rescue the king from Septima Tharn. Septima Tharn stabbed King Emeric and then vanished. The king appears to be wounded, perhaps mortally. I should speak to him. Septima Tharn killed the king, and his soul made the journey into the Far Shores. I must enter the Far Shores myself to bring him back. Septima Tharn killed the king, and his soul made the journey into the Far Shores. I've followed him into the afterlife to find his soul and bring him back. Septima has lured me into the Far Shores, where I am severed from Coldharbour and cannot escape. The powers in this place have offered me one chance: kill Septima Tharn, and I can take the king's soul back to the Mundus. I have killed Septima, and the powers in this place will allow me to take the king's soul back to the Mundus. I must leave the Far Shores and return the king's soul to his body. Finishes quest I defeated Septima Tharn, rescued the king's soul from the Far Shores, and restored him to life. I should speak with King Emeric about everything that happened. This page was last modified on 22 February 2019, at 22:42.